One of the many things I love about spring is the natural boost in flavor our foods can get. Sure you can grow herbs year round, but there's something about that outdoor grown herb that I just can't get over. Recently my local grocery stores have had awesome deals on herb seedlings, so I've just been picking up a couple here or there over the last few weeks they've been available. I've accumulated 7 or 8 different kinds to add to my collection. 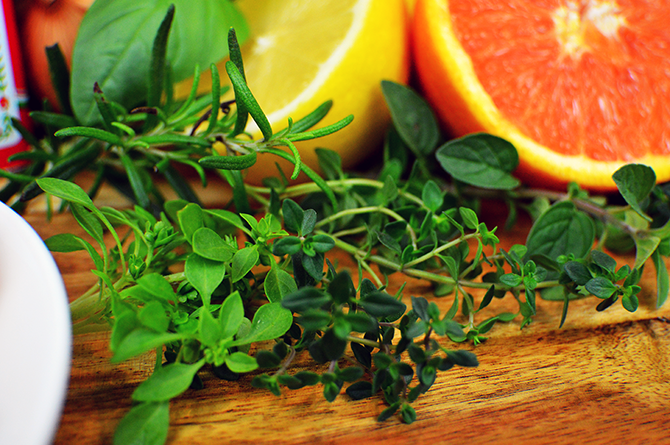 This particular combination includes: rosemary, lemon thyme, Italian oregano, sweet basil, and spicy globe basil. I can't wait to have a nice enough weekend to truly get my garden going. Since my garden must be contained on a balcony, things get a little crazy, so when it doesn't look like the garden department of Home Depot exploded on my patio, I'll post some pics for you all to check out. Start by slicing one of the lemons and one of the oranges. Juice the second lemon and orange. Overall, you should end up with about 1/2 cup of juice between the two. Then slice your onion into rings and set aside. Thinly chop the garlic and combine in a small bowl with the orange and lemon juice. Destem and chop the herbs then stir in the oil, sugar, and paprika with the juices. Pour the citrus marinade over the chicken, then pop into the fridge for about 30 minutes (or as long as you need) until chilled. 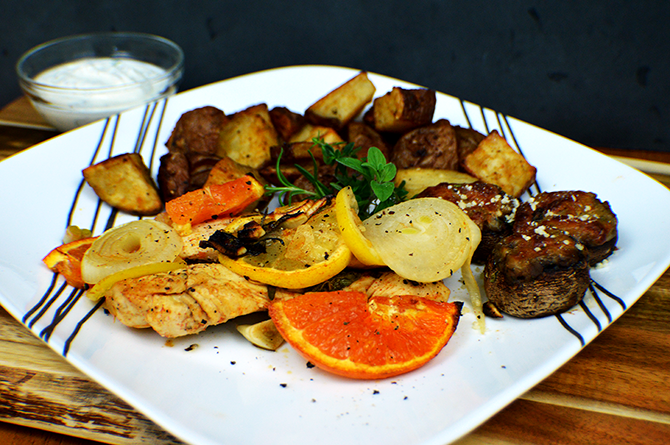 Lightly spray a 8x8 pan with cooking spray then line with the slices of lemon and orange. 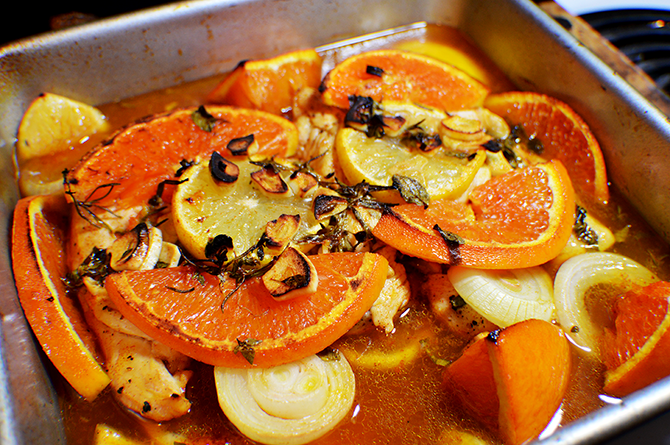 Place the chicken side-by-side in the pan, then arrange the rest of the slices of citrus and onions on top. 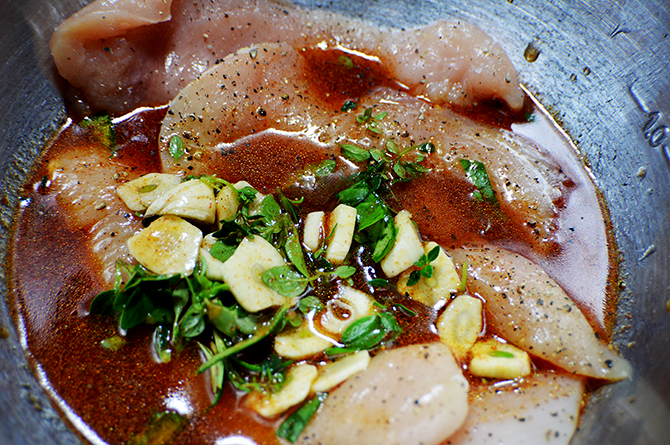 Pour the remaining marinade over and drizzle with olive oil. Pop into the oven at 375 F for 25-30 minutes or until the juices are bubbling and the chicken is cooked through. The tang of the citrus combined with the robust flavor of the fresh herbs gives this dish a delightful pop that's perfect for a warm spring evening. Combine with a side of garlicky potato fries with a cilantro lime dipping sauce and chorizo stuffed mushrooms for an incredibly tasty picnic! 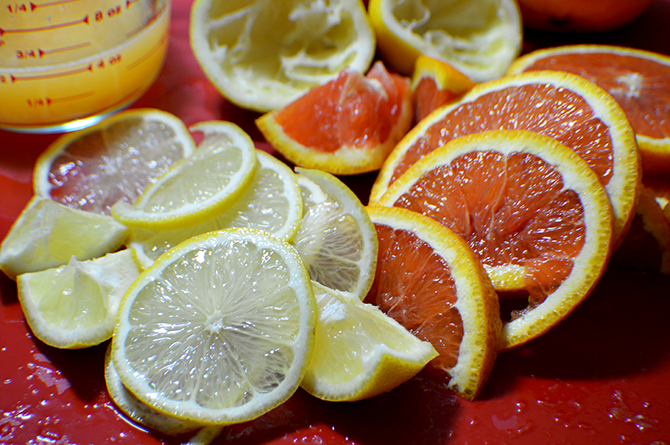 Slice one lemon and one orange into 1/4 inch pieces, then juice the second lemon and orange. Thinly slice the garlic then wash and chop the fresh herbs. Combine the juices, garlic, and herbs into a small bowl. Add the sugar and paprika then whisk in 2 tablespoons of olive oil. 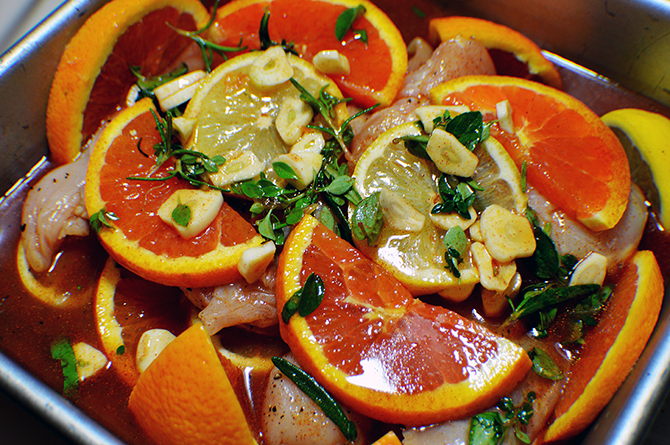 Pour the citrus mix over the chicken and refrigerate for at least 30 minutes. Preheat the oven to 375 F. Spray a square pan with cooking oil then arrange half of the slices of lemon and orange along the bottom. 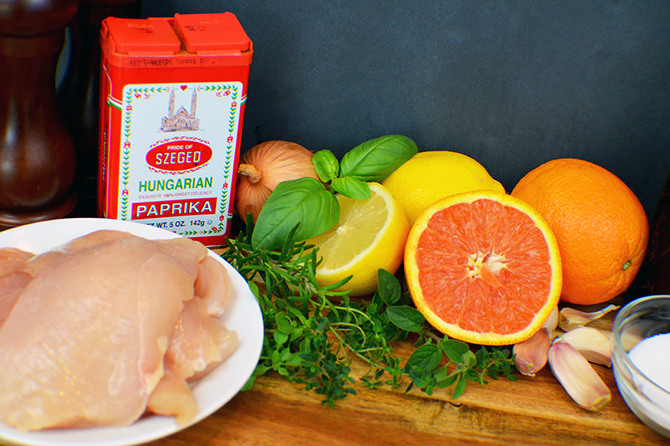 Place the chicken breasts in a single layer across the slices, then top with the remaining slices of onion, lemon, and orange. 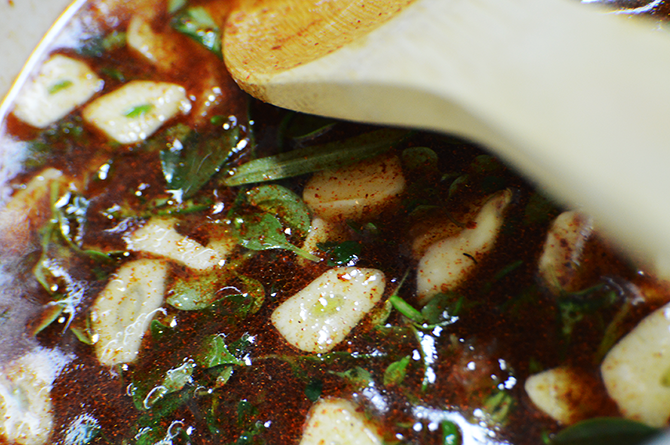 Pour the rest of the marinade over the chicken. Cook for 25-30 minutes, or until the juices are bubbling and the chicken is tender and cooked through. Let rest for about 10 minutes, then serve and enjoy!